For people relocating to Silicon Valley, often there’s not just one city, town or area which seems like a good fit. Sometimes it may come down to what your money can buy or how difficult it is to purchase in one area versus another. This is frequently the case with the “West Valley” areas where schools are good and the neighborhoods are tidy. There are two statistics which are especially helpful in understanding the Santa Clara County real estate market. 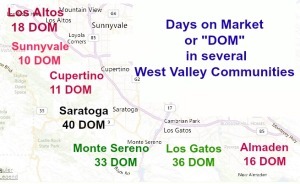 One is the “days on market” or DOM. The shorter this is, the hotter the market – and the harder it is to purchase. The second is the sale price to list price ratio, which hints at the existence of multiple offers, overbids, and buyers giving away all of their rights. Today, then, we’ll have a look at these, starting with Almaden, the southernmost area, and working our way north along the coastal range. The charts below are all for single family homes (houses and duet homes, not condos or townhomes). Almaden Valley is a district within the city of San Jose. Its boundaries roughly follow the 95120 zip code, though there are some parts of nearby zip codes which somewhat overlap into Almaden too. How’s the Almaden market? Red hot! Days on market is crazy low – a mere 16! And the average sale price is almost 104% of list price…and rising! Los Gatos is a bit north of Almaden and has many micro-markets within it based on proximity to downtown Los Gatos, the school districts, view of the hills or valley and many other factors. (This is “in town”, zip codes 95030 and 95032, not the Los Gatos Mountains 95033.) The market is also red hot in Los Gatos! The days on market are significantly longer (36 as opposed to Almaden’s 16), but the sale price to list price ratio is a tad higher here.